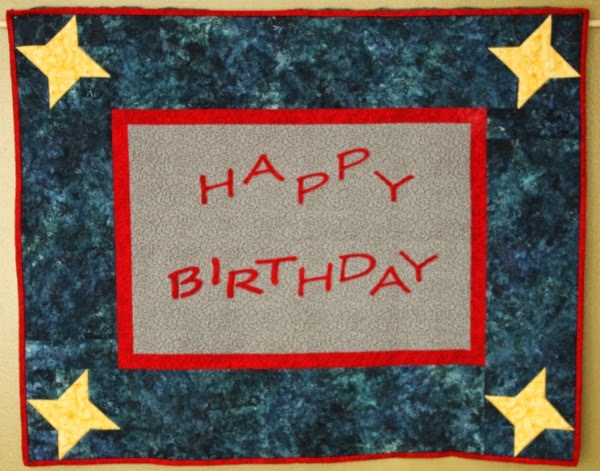 Devoted Quilter: Happy Birthday Devoted Quilter! Devoted Quilter is 2 today! I started this blog thinking it would be fun to maybe connect with other quilters, and it would be a great way to push myself to do more writing and especially to actually finish some writing. I didn't realize how fun it would be to become a part of the quilt blogging community, or how I would make friends with the people who comment on my posts. I didn't realize how many more blogs I would start reading, or how much I would be inspired by the bloggers I started to follow. I also didn't imagine how great it would be to have people comment on my devotion posts, or how I would spend days writing devotions in my head before getting around to typing them into my computer. ...I have written 96 devotions...96 finished pieces of writing that wouldn't have been finished if not for this blog. I've missed a couple of Mondays, but for the most part I've been consistent in keeping to my self-imposed schedule. ...I have designed a few quilts, and now have those patterns for sale in my Payhip and Etsy shops. The pattern for my Twirling Star mini quilt is currently being tested and will soon be available too. I also have two more designs in the works, one for the next issue of Make Modern magazine (eeek!) and the other for a tutorial in Fat Quarterly (eeek again)! ...My free motion quilting has grown by leaps and bounds. Partly because of Craftsy classes, especially those by Angela Walters, and partly because I see so many other bloggers doing amazing fmq designs that I want to try for myself. I am especially inspired by Renee, of Quilts of a Feather (who does her work on a domestic machine too), Angela Walters and Judi Madsen, both of whom use long arm machines. A birthday or anniversary is a great reminder to look back and see how far we've come, whether with our quilting, blogging or anything else and I've had fun the past week or so thinking about all the things that have come from my decision to start Devoted Quilter. God wants us to look back and remember sometimes too. In fact, He commanded the Isrealites to set up memorials that would ensure they remembered how He had protected them in the past. The Passover feast is one memorial, a reminder of how the Lord rescued the Isrealites from slavery in Egypt. You can read the story of the first Passover in Exodus 12, including God's command to Moses: "This is a day you are to commemorate; for the generations to come you shall celebrate it as a festival to the Lord—a lasting ordinance" (Exodus 12:14). God commanded another memorial while Joshua was leader of the Isrealites. They had just crossed the Jordan river and entered the Promised Land when God told Joshua, "Choose twelve men from among the people, one from each tribe, and tell them to take up twelve stones from the middle of the Jordan, from right where the priests are standing, and carry them over with you and put them down at the place where you stay tonight" (Joshua 4:2,3). Joshua chose the men, and told them, "Each of you is to take up a stone on his shoulder, according to the number of the tribes of the Israelites, to serve as a sign among you. In the future, when your children ask you, ‘What do these stones mean?’ tell them that the flow of the Jordan was cut off before the ark of the covenant of the Lord. When it crossed the Jordan, the waters of the Jordan were cut off. These stones are to be a memorial to the people of Israel forever” (vv. 5-7). Each time they prepared the Passover feast, or each time someone saw the pile of stones and asked why it was there, the people were reminded of what God had done for them. This wasn't only a reminder of the power He had shown them in the past, but also a reminder of the love He had for them, and of the power He would continue to use on their behalf. If we're always focused on the here and now, always looking at what we need God to do for us, then it's easy to doubt Him. We can't always see what He is doing today, but when we look back we can trace His hand in the events of our past. The psalmist Asaph found this to be a great comfort, which is immortalized in Psalm 77. The Psalm starts out with Asaph presenting all his fears and worries to God, asking how long he will have to put up with the current state of affairs. But then Asaph turns his mind to the past, to remembering all the things God has already done for him, which reminds him that God is in full control of our circumstances. Simply remembering what God has done for us in the past can help to put our current situations in perspective and give us hope that He will help us again in the future. How often do you look back and remember all the ways God has been at work in your life? Is there a special event or place that always makes you think back and notice God's hand in your past? Congrats on turning 2! You're doing a great job. Congrats on 2 years blogging and sharing!